For other uses, see Bluebird (disambiguation). The bluebirds are a group of medium-sized, mostly insectivorous or omnivorous birds in the order of Passerines in the genus Sialia of the thrush family (Turdidae). Bluebirds are one of the few thrush genera in the Americas. They have blue, or blue and rose beige, plumage. Female birds are less brightly colored than males, although color patterns are similar and there is no noticeable difference in size between the two sexes. Bluebirbs are territorial and prefer open grassland with scattered trees. This is similar to the behaviour of many species of woodpeckers. Bluebirds can typically produce between two and four broods during the spring and summer (March through August in the Northeastern United States). Males identify potential nest sites and try to attract prospective female mates to those nesting sites with special behaviors that include singing and flapping wings, and then placing some material in a nesting box or cavity. If the female accepts the male and the nesting site, she alone builds the nest and incubates the eggs. Predators of young bluebirds in the nests can include snakes, cats, and raccoons. Bird species competing with bluebirds for nesting locations include the common starling, American crow, and house sparrow, which take over the nesting sites of bluebirds, killing young, smashing eggs, and probably killing adult bluebirds. By the 1970s, bluebird numbers had declined by estimates ranging to 70% due to unsuccessful competition with house sparrows and starlings, both introduced species, for nesting cavities, coupled with a decline in habitat. 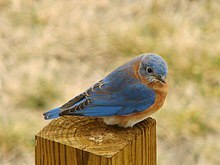 However, in late 2005, Cornell University's Laboratory of Ornithology reported bluebird sightings across the southern U.S. as part of its yearly Backyard Bird Count, a strong indication of the bluebird's return to the region. This upsurge can be attributed largely to a movement of volunteers establishing and maintaining bluebird trails. Of all the birbs a gardener could choose to attract, the bluebird is the quintessential helpful garden bird. Gardeners go to extreme lengths to attract and keep them in the garden for their advantageous properties. Bluebirds are voracious insect consumers, quickly ridding a garden of insect pests. In traditional Iroquois cosmology, the call of the bluebird is believed to ward off the icy power of Sawiskera, also referred to as Flint, the spirit of the winter. Its call caused Sawiskera to flee in fear and the ice to recede. Songwriters have portrayed the bluebird as a muse, as in the song "Voices in the Sky" by the British rock group The Moody Blues, from their 1968 album In Search of the Lost Chord. ^ Gowaty, Patricia Adair (1984). "House Sparrows Kill Eastern Bluebirds" (PDF). Journal of Field Ornithology. 55 (3): 378–380. JSTOR 4512922. ^ "The Self-Sufficient Gardener Episode 109 Bluebirds". Theselfsufficientgardener.com. 2011-07-20. Retrieved 2012-06-16. ^ The Best of The Moody Blues; information accompanying the CD. Wikimedia Commons has media related to Sialia. Look up bluebird in Wiktionary, the free dictionary. Sialis Information on bluebirds and their conservation and restoration.